The Irrawaddy River has given life to Myanmar and has witnessed its history. On its banks are all the highlights of this Golden Land. Admire the city of Pyay, where the roots of the Bamar civilization can be found. Marvel at the royal capitals of Mandalay, Amarapura and Ava. Be astounded by the glorious city of Bagan with its 3,000 temples and pagodas, where the First Myanmar Empire was founded. Board the ship at Bagan and enjoy a welcome cocktail in the saloon. After lunch, walk ashore at Salay, a small town founded in the 13th century with Bagan-era shrines, beautiful 19th century teak monasteries and preserved British colonial buildings. Explore Salay House, a restored 1906 colonial trading company warehouse on the bank of the Irrawaddy. Inspect the town’s main Strand Street and the local market before visiting the beautiful Yokesone Monastery. Dinner and moor overnight mid-stream. 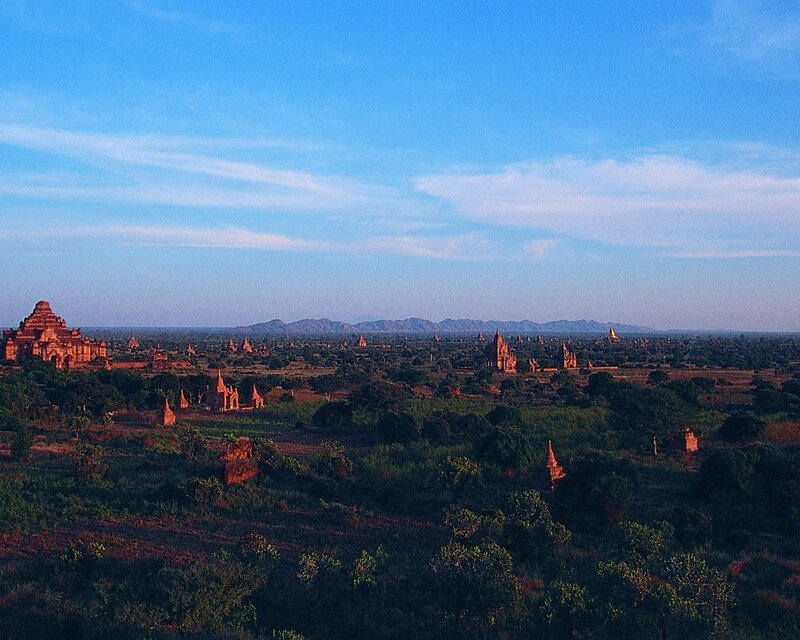 Experience Bagan, one of the most incredible areas of Myanmar. Once the centre of the Pagan Empire, Bagan today is a tourist, artist, and archaeological wonder. Start the tour with Shwezigon Pagoda and the massive Htilominlo Temple. Then stop by Thatbyinnyu Temple for a photo on the way back to ship for lunch. After lunch, visit Gubyaukgyi Temple, where the richly-coloured paintings are thought to date to the original construction period in the early 12th century. See a sand painting demonstration by a local artist. See the Myazedi inscription, which is of both linguistic and historic significance, as the inscription is in four languages (Pyu, Mon, Old Burmese, and Pali), confirming Pyu as an important cultural influence in the early Pagan period. No visit to Bagan would be complete without exploring one of the most famous temples of Bagan, the Ananda Temple. Stop by Dhammayangyi Temple for a photo. The final stop of the day is the Bagan Viewing Hill to view the sunset over the pagodas and stupas of Bagan before returning to the ship. Explore some of Bagan’s local markets selling wood carvings, fabric, longyis and rattan product. Visit a workshop to see the ancient technique of lacquerware making. Alternatively, guests can hire a horse cart or a bicycle and explore the site on their own or have a splendid balloon flight over Bagan (surcharge applied). Back to the ship for lunch. The ship cruises upstream for the rest of the day, with a stop at village for a walk. Dinner will be followed by a puppet show on the sundeck. In the morning the ship arrives at Yandabo, a picturesque river village specializing in pot making, where the peace treaty of the First Anglo-Burmese war was signed in 1826. Take a walk to some pot-making workshops and visit the monastery. For the rest of the day, the ship cruises upstream, mooring overnight near Myinmu. Take an early morning drive by coach (approx. 1 ½ hours) to Monywa to visit Phowintaung, a complex of caves with hundreds of statures of Buddha. Lunch will be served at a local restaurant in the Win Unity Hotel in Monywa. After lunch, visit the splendid Thambuddhe Pagodawith its more than 500,000 Buddha images. Drive back to Myinmu and overnight on the river bank. Visit Ava (also called Inwa) by horse-cart. Visit the beautiful 200 year old teak Bagaya Monastery, the 27 metre high watchtower and the Maha Aungmye Bonzan Monastery (commonly known as Me Nu Ok Kyaung Monastery). Return to ship, which sails to Sagaing. In the afternoon, visit a hill studded with many pagodas and monasteries rich in wood carving and religious art. 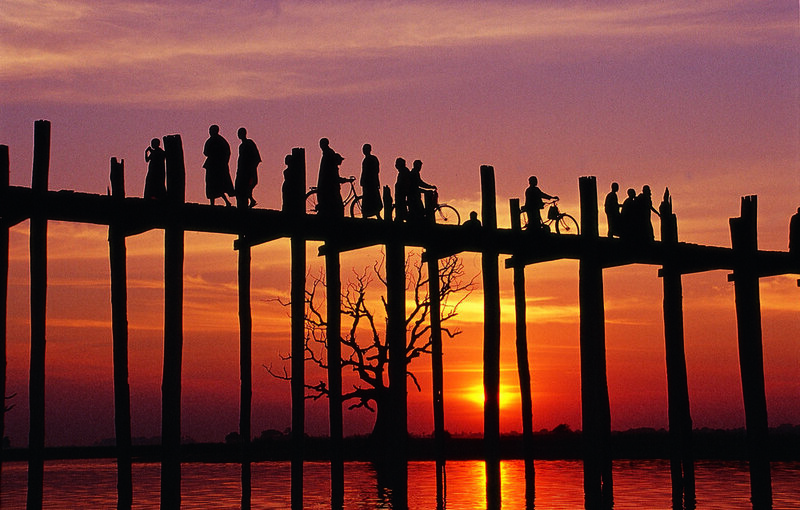 Then travel by coach to Amarapura, the penultimate Burmese Royal Capital to visit a traditional silk weaving workshop followed by the U Bein Bridge, which at 1.2 km long is the world’s longest wooden bridge. Enjoy the sunset there. Dinner and overnight on board near Sagaing Hill. After breakfast, enjoy a leisurely walking tour of the small town of Mingun. The first stop is King Bodawpaya’s monumental, uncompleted stupa. Stop at the local market, famous for its makeshift galleries that display inexpensive art from both local and internationally known artists. In the afternoon, visit central Mandalay, the Mahamuni Buddha Temple, and the gold leaf and marble carving workshops. Visit Kuthodaw Pagoda, which contains the world's biggest book, and nearby Mandalay Hill where spiralling staircases lead to sweeping views of the city and its temples. Enjoy the sunset on Mandalay Hill, then return to the ship for dinner. Overnight at Mandalay. The Irrawaddy and Chindwin rivers are subject to seasonal rises and falls of water level. In the case of water levels being too high or low an alternative itinerary will be offered.